We left Plattsburgh heading into a strong south wind, slowing our progress considerably. Traveling with the Lois has given me a greater appreciation for the patience and pace of the 1800s. Thankfully, we are able to stick to our schedule with the help of the C.L. Churchill. Essex appeared after a few hours of motoring into the breeze, and blasting through the short chop. The blunt bow of Lois makes for some impressive spray when a wave hits it just right. As we pulled into the Essex Shipyard, I was reminded that this is where the General Butler was built. Bringing the Lois, which is largely a recreation of the Butler, back to Essex has the sense of closing the circle. In the 1800s, Essex was a massive shipping port. 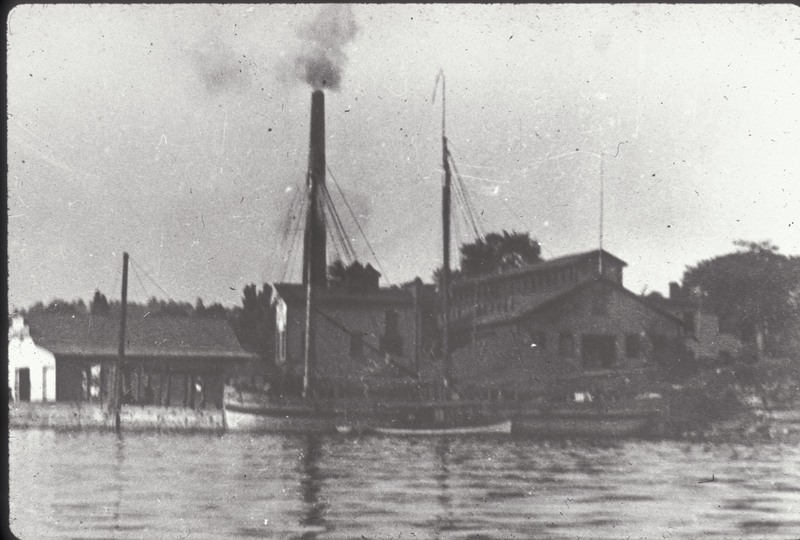 Stone from the local quarries was the largest export, but there were warehouses lining the waterfront holding many varieties of cargo for canal boats to bring all over the Champlain waterways. Today, Essex still shows the results of this era of shipping. Many houses are built with stone from the local quarries, and signs of the shipping companies are still visible throughout the community. During our visit, despite the threatening weather, we were still visited by many enthusiastic Essex residents who were excited about revisiting the past history of the lake. 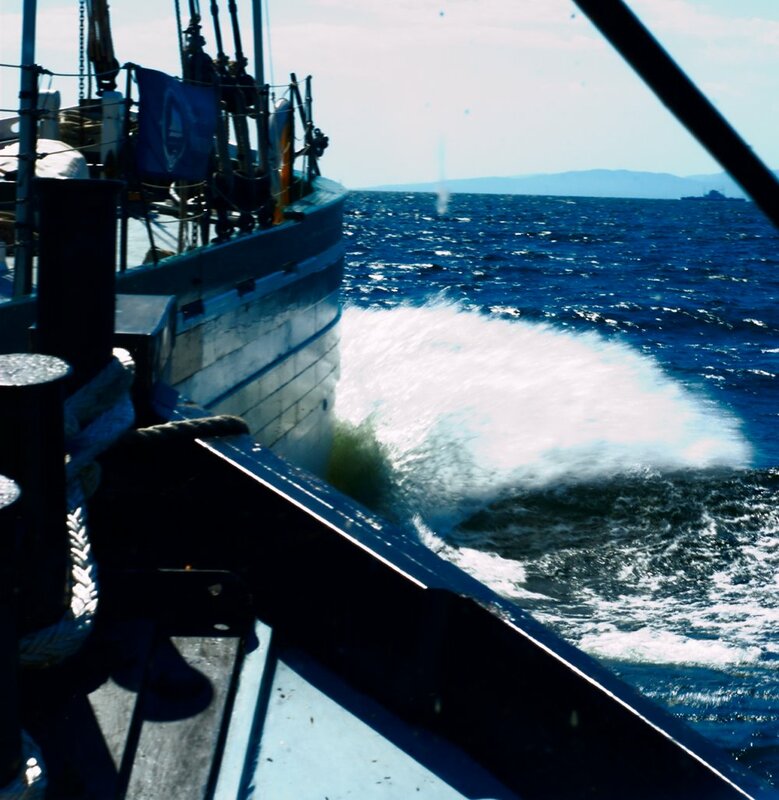 Being able to use the port of Essex as an interpretive tool was a wonderful way to connect with people. The weather built through our visit, and on the afternoon of the first day, we had to move the C.L. Churchill to a different slip, as she started to impersonate a porpoise. The evening before we left, LCMM Board Chairperson Darcy Hale invited the crew over to her house for dinner. Darcy lives in Westport, and is currently in the process of organizing the records of a quarry from the 1800s that she and her husband Bruce recently purchased, right across the road from their house. Over a dinner of perfectly cooked steaks (courtesy of her son Andrew), Darcy shared the latest developments from that as well as chatted with us about our plans for the upcoming hurricane. It was a nice relaxing evening, capped with delicious German chocolate cake. Thank you Darcy for a great meal, and thank you Essex for a great visit!